WHAT!! How did you do that so fast? I can't wait to see more! okay seriously. you must have worked through the night! Completely intriguing! Can't wait to see what all of these pretty colors turn into! It fits that it is on wordless wednesday because I'm speechless!! Very pretty, great colors and contrast. It looks just wonderful!! However, I am thinking that not much sleep goes on in your household?? I just love the range of solids you've used, it looks fantastic! 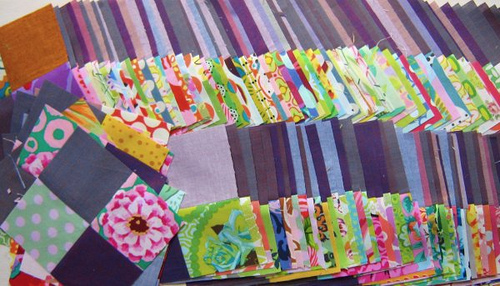 And I love those big face on flowers, Kaffe Fassett? Have you fallen in or out of love with purple yet? I love the colors! Really beautiful. The picture says it all, Rita - gorgeous! i love the purple!! i can't wait to see more! Gorgeous!! 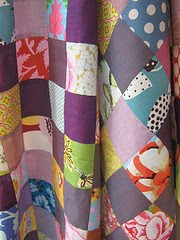 i can't believe this quilt has been produced by someone who once told me they didn't like purple!! uGGH! You're killing me. I've completely changed my style of quilting since seeing you online. You're amazing. OK that is beautiful - what a stunning quilt! Love this use of purple as a neutral! A beauty! I want to see more!!!! Looks fantastic. Hi Rita, this is spectacular. Like you, I am not really that drawn to purple but this looks wonderful. I'm very excited as your Amy Butler Love quilt inspired me to make "a little" purchase from Fat 1/4 shop that arrived yesterday - just love unwrapping these little deliveries from the postman. ooo...I want to see it unfolded! Love this!!! Can't wait for the details. Who needs words when you are look at loveliness like this??? Considering two of my four boys count purple as their favourite colour and that I am in the midst of starting a quilt for one of them I'm going to have to hide this, for yours will put mine to shame! Oh, my, I am loving the look of this. So purplely pretty!!! It's going to be beautiful. It already is! 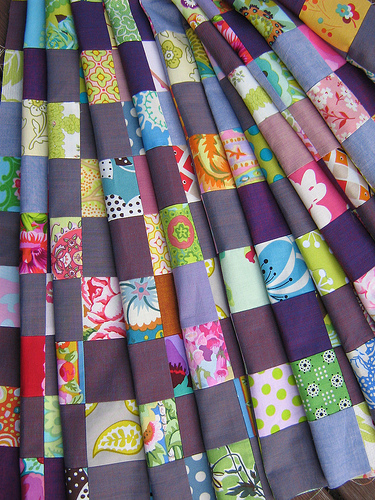 And, by the way I love your scrappy pieced border quilt. Thanks for the tutorial on that. I'm going to have to make one, one of these days! I left one comment, but something went awry and it didn't show up. In case it does, please forgive. I wouldn't call this wordless with all the comments left, it seems many had words to express how beautiful this is.